Thanks for coming out to celebrate “The Spot” Grand Opening with a dope Group Art Show! 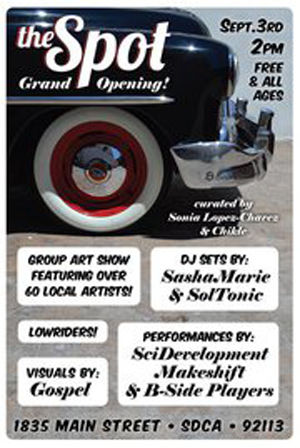 Including live music, over 75 Artists, visuals, and some of the baddest custom cars in San Diego!!!! Same day in the Barrio Logan Arts District shows will be happenin all over including the international San Diego Art Fair, Roots Factory, Voz Alta and many more! DONT MISS OUT! ******Doors Open at 2:00pm. 1st performance at 6:00pm. Original pieces by: Ricardo Islas,Jen Fong, Pixie Lopez, Mario Chacon , Jim Ruland, Nuvia Crisol Guerra, Franky1, Mike Boshart, Brandon Roth, Chi Hom , Jordan Hom, Patty Alaniz, Chuy Espinoza, Jason A. Gould, Anselmo Juan , Jorge Piña, Scott McPherson, Bat Brain, Aileen Reyes, Sarah Brown, Wika, AndrePower, Cesar, Castañeda, Selina Calvo, Jesse Picasso, Eric Wixon, David Varela, Ryan Seaman, Jason Van Noord, Ryan Bromley, Jaime Garcia, Cathy Lee, Ukeim Ortiz-Rosado, Memo Hoffman, Ez Rock, Marina Lorenzana, Alex ARPED, Jona Tellez-Giron, Justin Rosales, Jahvanna Audrianna, Steven Suiter, Jack Stricker, Sumo1, Brian Hebets, Michael Briones, Letitia Rogers, Elizabeth Piña, Angela Gigliotti, Chosen, El Cien Caras, Lester, Corral, Dezi Dezz, Sam Fuentes, Gumaro Enrique Piña, Bret Barrett, Fungus, Max Bojorquez, Jack Owen Art Victor Villa, German Corrales, Abel Guzman Art, Paul Ruiz, JTheory, Chris Konecki, Cory Burke, Monty Montgomery, Four, Sonia Lopez-Chavez.